Yeah, that'll play. Well done, "group of prominent global, national and local architects including Wisconsin-based firms Eppstein Uhen and HNTB" led by Populous! 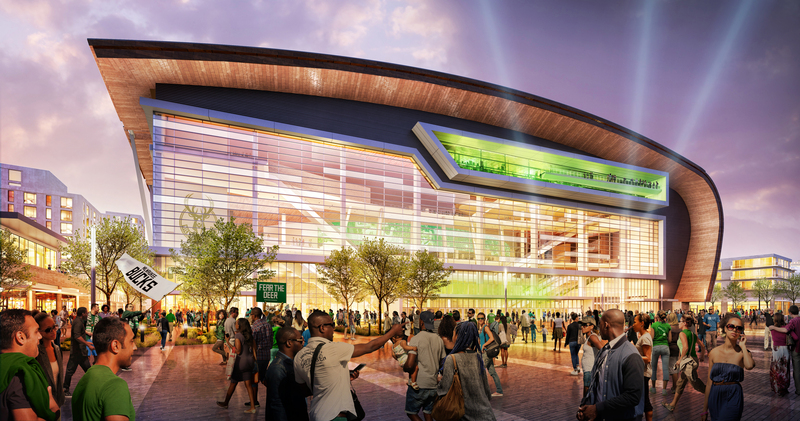 The shape of the 714,000-square-foot arena's arcing roof has changed subtly from initial plans. The abstract, wavelike form begins near the base of the building on W. Juneau Ave. and arcs dramatically over the glassy entrance. The roof is the "big move," the statement of the $500 million building, said Clark. It will be clad in long, thin zinc panels chemically treated to achieve a gritty, brown-rust patina. The matte panels can take on a leather-like look and will change appearance in varying types of light, said Gabe Braselton, one of the lead project managers at Populous. The idea for the wavelike shape surfaced in sketching sessions among Populous architects before the firm had been hired and when the Bucks were still eyeing the Journal Sentinel site, near the Milwaukee River. "We think there's beauty to the region and water is a big part of that," Clark said, adding that they also wanted to emphasize Milwaukee's industrial grit. "We know that's important to your community." "We love the new design, and if the Scott Kindness-designed building was an inspiration, more power to them. We are all inspired by our surroundings — the people in our lives, art, architecture and great design. Looks like the Bucks have a real winner on their hands," said Bel Air Cantina. 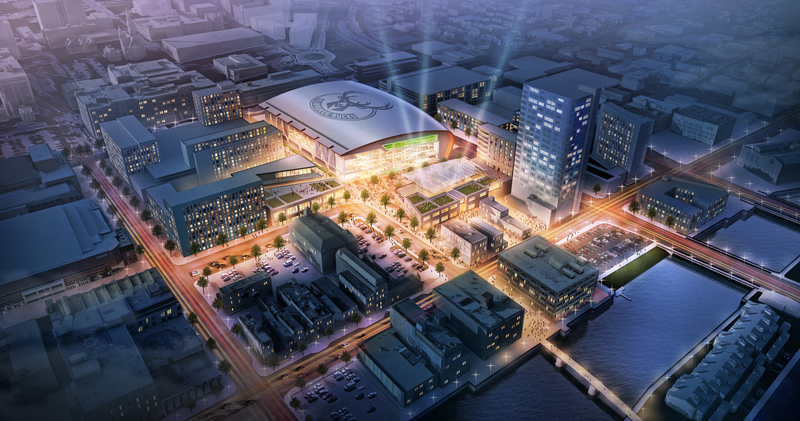 The 714,000 square foot arena will be the centerpiece of a "nearly 30-acre district" that will also include a new training facility for the Bucks, parking, "a new entertainment block" and space for other commercial and residential properties, according to the team. 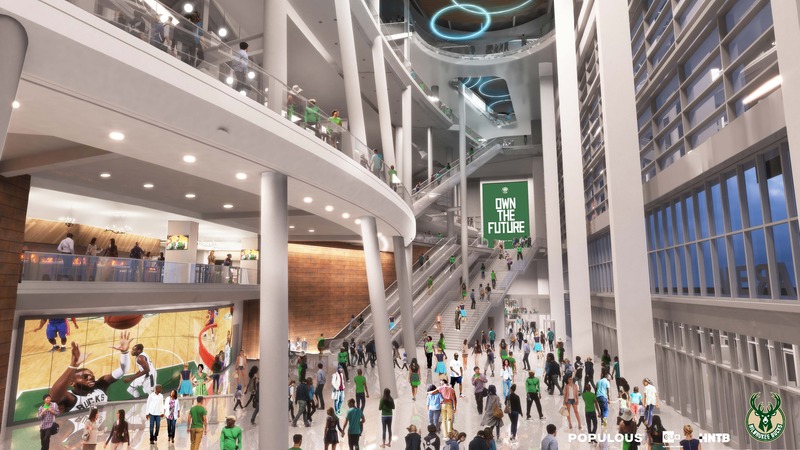 The new designs and detailed plan are scheduled to go before the City Planning Commission on April 4, according to Schumacher, and the Bucks hope to break ground on the arena this July with the goal of having the building ready for business in time for the 2018-19 NBA season. Whether the project as a whole will eventually produce the sort of windfall promised by the Bucks and the politicians who voted in support of the quarter-billion in public funding remains to be seen, but if nothing else, it ought to look pretty cool, distinctive and regionally appropriate, which is no small thing. A beer barrel's a much better thing to end up with than a toilet, after all.